“Venezuela energetically rejects the new attempt from the Government of Canada to impose unilateral coercive measures against Venezuelan citizens, in blatant violation of the most fundamental rules of the Public International Law,” reads the statement. “Facts suggest that this servile policy of the Canadian authorities is the result of that government’s urgency to avoid losing benefits and preferences in the trade agreements with the United States,” the statement added. Canada announced Monday it would impose sanctions on 14 persons close to the Venezuelan President Nicolas Maduro, including his wife and member of the National Constituent Assembly (ANC), Cilia Adela Flores, “in response to the illegitimate and anti-democratic presidential elections” carried out on May 20. Besides the first lady, the affected officials include Tania Valentina Diaz Gonzalez, Fidel Ernesto Vasquez Iriarte, Carolys Helena Perez Gonzalez, Erika Del Valle Farias Peña, Ramon Dario Vivas Velasco, Christian Tyrone Zerpa, Fanny Beatriz Marquez Cordero, Malaquias Gil Rodriguez, Indira Maira Alfonzo Izaguirre, Jhannett Maria Madriz Sotillo, Carlos Enrique Quintero Cuevas, Xavier Antonio Moreno Reyes and Carlos Alberto Rotondaro Cova. The announcement was made a day after the Organization of American States (OAS) declared that the Venezuelan government had committed “crimes against humanity,” following the agenda led by the United States economic and political interest in the region. 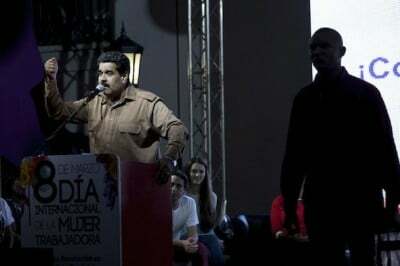 Some factions of the Venezuelan opposition boycotted the recent presidential election stating that they didn’t consider them fair or transparent despite having reached an agreement with the Bolivarian government before suddenly rejecting it. The European Parliament, the U.S., and the Lima Group, a group of right-wing governments with Latin America and the Caribbean, also announced sanctions following Venezuela’s elections.